The Mississipi delta, where the freshwater river pours into the salty Gulf of Mexico, would be an enormous source of energy if we could tap it. A device that gleans usable energy from the mixing of salty and fresh waters has been developed by University of Milan-Bicocca physicist Doriano Brogioli. If scaled up, the technology could potentially power coastal homes, though some scientists caution that such an idea might not be realistic. Extracting clean, fresh water from salty water requires energy. The reverse process—mixing fresh water and salty water—releases energy. Physicists began exploring the idea of extracting energy from mixing fresh and salty waters, a process known as salination, in the 1970s. They found that the energy released by the world’s freshwater rivers as they flowed into salty oceans was comparable to "each river in the world ending at its mouth in a waterfall 225 meters [739 feet] high," according to a 1974 research paper in the journal Science. But those who have chased the salination dream have collided with technological barriers. Brogioli has developed a new approach to salination, a prototype cell that relies on two chunks of activated carbon, a porous carbon commonly used for water and air filtration. Once he jump starts the cell with electric power, all that is required to produce electricity are sources of fresh and salty water and a pump to keep the water flowing. When the separate streams of salty and fresh water mix, energy is released. A typical cell would require about three dollars worth of activated carbon, and, given a steady flow of water, the cell could produce enough electricity to meet the needs of a small house. It's the equivalent, in hydroelectric power, of running your appliances from a personal 100 meter (338 feet) high waterfall. Salination would be an ideal technique for places where fresh and salty waters naturally mix, such as estuaries, according to Brogioli. He said that a coastal community of about a hundred houses could set up a plant with minimal damage to the ecosystem. "A salinity difference plant will be much smaller than a solar plant," he said. The only waste product is slightly brackish water that can be poured directly into the sea or, Brogioli suggested, into ponds that support estuary-friendly flora and fauna. Instead of using fresh water, an increasingly scarce global resource, a salinity power plant could use water that is polluted or slightly contaminated with salt, giving new life to unusable water, Brogioli said. Seawater could also be mixed with high-salinity water, obtained by evaporating seawater—perfect for a desert community with little fresh water but sunshine to spare. "Preliminary evaluations confirm that the setup can be scaled up to very big plants suitable for powering whole cities," said Brogioli. Scientists agree that Brogioli's concept is sound but are cautious to declare it practical on a large scale. "I don't see any reason why it should not work," said Yury Gogotsi, director of the A.J. Drexel Nanotechnology Institute at Drexel University in Philadelphia. "Capacitor desalination has been demonstrated and commercialized, and this can be called reverse capacitance desalination. It appears to be a logical approach. Of course the challenge is the practical implementation." George Crabtree, a senior scientist at Argonne National Laboratory in Illinois, said he likes that the device extracts the energy as immediately usable electricity. But he sees difficulties in scaling up from a lab experiment to megawatt plants that could compete with wind turbines or other clean energy sources. 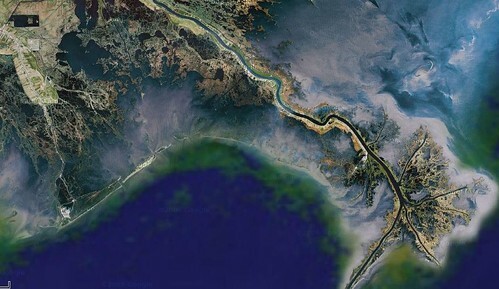 Crabtree thinks the water requirements might limit the technology to large river deltas, like the mouth of the Mississippi. The energy it could potentially generate, he said, "is significant ... [but] not enough to solve everyone's problems." Fred Schlachter, a retired staff scientist at Lawrence Berkeley National Lab in California, is more skeptical. Brogioli’s experiment, says Schlachter, “only demonstrates that it works in concept on [a small] scale." He points out that salt water is very corrosive, which is one reason that renewable energy ideas for harnessing ocean tides rarely get off the ground. "Realistically I've never seen anything involving the ocean work," he said. Brogioli maintains that his salinity cell could be ramped up faster than other salination approaches and could be made as affordable as solar power in a decade or so. He argues that any new renewable energy source is worth looking into, even if it is only a partial solution to our energy and environmental problems. "There is no really clean energy source, and none of them can replace fossil fuels alone," he said. "So, it's a matter of compromise: find the best resource for a given region and use many different resources together." A paper describing Brogioli’s research is due to be published in an upcoming issue of the journal Physical Review Letters. Energy, just from mixing salty water with fresh? Yes, thanks to a fundamental truth: nature likes disorder. Your coffee always seems to go cold before you can finish it, and your just-organized desk reverts to a chaos of post-it notes, random physics toys, and those half-drunk cups of coffee at an alarming rate (if you're anything like me, at least). According to thermodynamics, increasing a system's entropy, or roughly how mixed up it is, releases energy, but the ridiculousness of trying to harness the mess in your cubicle to run your computer gives you a sense of how hard it would be to grab the stuff. But Brogioli has devised an ingenious way to reap this energy windfall and turn it into a voltage gain in a capacitor. As the above article mentions, he key ingredient in a salt-water capacitor is "activated carbon," extremely porous carbon made from wood, coal, or coconut shells. Its Swiss-cheese structure means just a gram boasts an incredible 1000 square meters of surface area. It's commonly used in water and air filtration; you've probably drunk water that was filtered by activated carbon. The large surface area also makes it an ideal material for capacitors, because the greater a capacitor's surface area, the more charge it can store. Brogioli created a prototype salination cell with two chunks of this porous carbon submerged in salty water. The chunks are connected to a power supply, which forces negative charge to accumulate on the surface of one chunk, and positive charge to accumulate on the surface of the other. The charge also attracts the salt in the water. Salt water is a soup of free-floating ions, positively charged sodium and negatively charged chloride. Chloride ions huddle near the positive chunk, while a crowd of sodium gathers near the negative one. Then Brogioli flushes the cell; salty water pours out, fresh water rushes in, and a battle ensues. Electrostatic attraction tries to grip the ions near the carbon chunks near the carbon chunks, but diffusion tears them away. The work that diffusion does against the electrostatic force results in an increase in the capacitor's voltage, much as lifting a ball off the ground against gravity raises its potential energy. (If you know college physics, it's analogous to forcefully removing a dielectric from a capacitor you've charged and disconnected. The capacitance drops, but because C=Q/V the voltage goes up.) So the capacitor gains the energy that mixing the water releases. The capacitor can now be discharged in a current used to light a bulb or power a computer. Finally, Brogioli flushes the cell with salty water and charges the capacitor, beginning the cycle again. Brogioli's laboratory cell, which squeezes out a mere 5 microjoules per cycle (better materials, he said, would get a payoff of 1.6 KJ per liter of fresh water) has to operate below 1 volt. Anything higher would cause redox reactions on the electrodes, allowing the salt ions to trade electrons with the carbon, and suddenly your dielectric is a watery conductor. Robert Norman, the author of the original Science article on saline-based energy devices, said he thinks this is a major hangup. Real river water and seawater, he said, might have an even lower tipping point. reply as I'm looking to design my own blog and would like to find out where u got this from. Hello, Sir. Can I raise a question? Generating electricity can even happen when the salt water(sea water) and fresh water are already mixed in a one particular place? Briefly, it can produce electricity when mixing process did not occur because of the place where salt water and fresh water already mixed? Thank you for anyone who take time to read this concern. It's so very important for me to now. THANK YOU. Can anyone pls tell me what is the reason behind the production of electricity from salt water? This process would be ideal for countries in the archipelago or those that are surrounded by bodies of water. However I think it would be a bit costly. Awesome! !That's really a great idea to produce electricity from salty water.The process is explained so clearly and precisely.Great work!! We must promote and apply the use of green energy. We promote Solar Powered Water Purification system, a systems turn polluted water from surface sources or from contaminated wells into safe, clean drinking water that powered by Solar Power that are not harmful to our environment. thank you for the post Author. Help end Global Warming by spreading relevant information. Bring public awareness that will influence our Government Leaders to listen to what the public wants and enact legislation to help reduce climate change. Consider the CO2 required for making activated charcoal/carbon and that this material will probably need replacing at regular intervals as well. Factor in pumping, filtration and the permits required for intake structures (impingement & entrainment) of biotic organisms in sensitive estuarine waters. Nuclear fusion starts to sound good right about now. For every 1 cubic meter of fresh water mixing with 1 cubic meter of salt water (3.5% normal sea water), a theoretical maximum energy of 2 MW/cu. m per second is available. This energy will be low efficiency unless ionic membranes are utilized (see Marc Andelman´s patents-charge barriers), which would increase the cost. Just consider the pumping costs and filtration costs of that quantity of water before one chases the salination dream (many rivers unfortunately have high levels of sedimentation). 1. Solar electric power generator. The expose to sun light salt water will evaporate and then condensate the vapor as it is in conventional solar desalination, then the fresh water and salt water will be combine in the cell to produce electricity. Close loop system. I wonder what the efficiency will be. 2. Use fresh water, let say from rivers, as fuel for sea ships instead of bunker oil. It is clean renewal energy driven by sun energy similar to wind power. If this can generate power from mixing normal salt water and VERY salty water, could this be used for desalination? It takes power to separate fresh water from salt water (from the ocean), leaving behind extremely salty water. Mix this extremely salty water with normal salt water (again, in the ocean) to produce energy to power the separating of fresh water from salt water, and so on. Even if it only provided SOME of the power needed for desalination, it would help. One of the problems with desalination is that it produces very salty water that has to be dumped back in the ocean (not good for sea life). The other is that it requires power. Let one problem solve the other. Logical first place to install this technology would be seaside water treatment facilities. They already reclaim methane from waste water and use it for energy production. Since the power seems to come from a difference in salinity, it provides up yet another reason build a pipeline from the Red Sea or Mediterranean to the Dead Sea. Some electricity would be generated from the 1100 foot fall from sea level to the Dead Sea, the lowest place on the surface of the earth. Additional power would come from mixing ordinary sea water with the extremely salty water of the Dead Sea. The two might make the project economically viable. In addition, the salt water inflow would prevent the Dead Sea from drying out and the salt water that's brought it could be used for fish farms before being released into the Dead Sea. And in the end, this is a form of solar power, the energy ultimately coming from evaporation off the Dead Sea. It also wouldn't be complicated by the difficulties of building a power plant between a river and and ocean.